1. How do I log in? 11. Why can’t I see a product I know you carry? item is not available' and I can't order it, even though it is in stock? 3. How do I change my password? 13. How do I backorder items? 4. How do I change my warehouse shopping preferences? 14. How do I preorder items? 5. How do I change the shipping address for an order? 15. How can I see what I have on backorder/preorder? 6. What does allocation mean? 16. How do I know when backorders/preorders will be in stock? 7. How do I upload an order? 17. How do I have my preorders and backorders included with my order? 8. How does the Advanced Search tool work? 18. How do I get credit for damages, defects, or missing items in my order? 9. How do I search by UPC? 19. How to I view my historical and aged/open transactions? 10. Is there a way to show available inventory for all warehouses? 2. How do I get to My Dashboard? 4. How do I change my warehouse shopping preferences? 5. How do I change the shipping address for an order? 6. What does allocation mean? 7. How do I upload an order? 8. How does the Advanced Search tool work? 9. How do I search by UPC? 11. Why can’t I see a product I know you carry? 12. What does it mean when a products says 'Allotment for this item is not available' and I can't order it, even though it is in stock? 13. How do I backorder items? 14. How do I preorder items? 15. How can I see what I have on backorder/preorder? 16. How do I know when backorders/preorders will be in stock? 17. How do I have my preorders and backorders included with my order? 18. How do I get credit for damages, defects, or missing items in my order? 19. How to I view my historical and aged/open transactions? Click the ‘Login’ button in the upper right corner of the website. Enter your Customer ID, email address, and password, and click ‘Login’. Click the ‘My Account’ icon (located to the left of the cart icon in the top right corner). You can also access My Dashboard using the ‘My Account’ link under Customer Info at the bottom of the page. Navigate to My Dashboard, select ‘Change Password’ on the left hand side of the page, and enter the information requested. Navigate to My Dashboard, under Shopping Preferences select or unselect ‘Shop from primary warehouse only’. This will change your default setting for future sessions. In the shopping cart, select ‘All Warehouses’ or ‘Primary Warehouse Only’. This will change your setting for the current session only. Navigate to My Dashboard and click on ‘Address Book’ on the left hand side of the page. 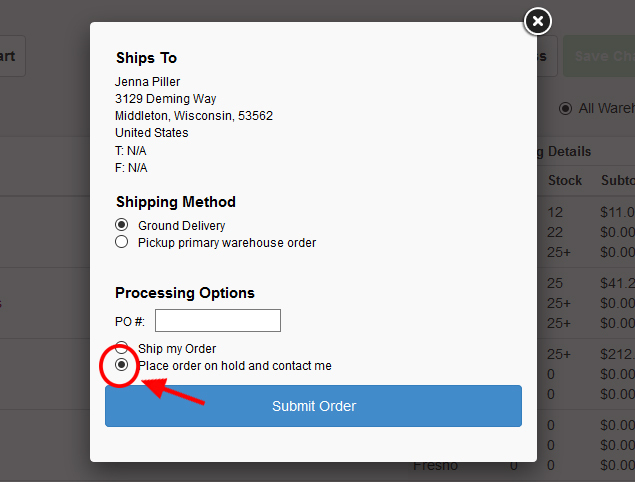 Under the Shipping Address, click the ‘Change Shipping Address’ link, select an address from the dropdown menu, and click the ‘Update Preferences’ button. From the shopping cart, click on the Shipping to address link (see graphic below), select an address from the dropdown menu, and click the ‘Update Preferences’ button. Allocations are implemented when limited quantities are available. It is a preset limit on a product that determines what the maximum quantity a customer can order per week. 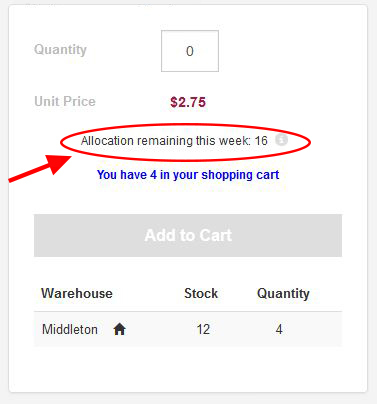 If a product has an allocation, your allocation remaining for the week can be viewed under the Unit Price on the product detail pages. Please note that allocation does not mean that the product is reserved for you unless you place an order for it. Navigate to My Dashboard and click ‘Order Import’ on the left hand side of the page. Click the ‘File Upload’ button and upload a CSV file that contains only columns for Item and Quantity (in that order). Once the file has uploaded, make any necessary changes and click ‘Add All Items To Cart’. Click on the Advanced Search icon (located to the right of the search bar in the top right corner – see graphic below). Enter search criteria into any of the fields and click the ‘Search’ button at the bottom. To select multiple product categories filters, hold the Ctrl key and select additional categories. To clear all categories, click the ‘Clear Filter’ button. Do the same thing to select multiple manufacturer filters. Once you click ‘Search’, a product listings page will appear. If you would like to make changes to your search, click the ‘Modify your search’ button, which will bring you back to the Advanced Search tool, and make the desired changes. To search by UPC, type the UPC code into the search bar at the top of the page. You can also search by UPC, along with other criteria, using the Advanced Search tool. We realize that you cannot see inventory for all warehouses when looking at products on the list or grid view. If your shopping preferences are set to ‘All Warehouses’, once an item has been added to your cart you can view inventory for all three warehouses on the cart page. The information can also be viewed the product detail page. Items will not be visible to you if you are not allowed to purchase them based on restrictions put in place by the manufacturer. If you have questions about your restrictions, please contact your sales rep.
12. What does it mean when a product says ‘Allotment for this item is not available’ and I can’t order it, even though it is in stock? Some products with a future street or release date are restricted from being ordered through the website. This is to ensure that the street/release date is not violated. If you would like to order the product, please contact your sales rep and they can manually enter it for you. Add items to cart and proceed to checkout as normal. Any items that are not currently in stock will be added to your backorder. Add preorder items to your cart and proceed to checkout as normal. For a list of everything that you have on backorder/preorder, please contact your sales rep.
For preorders, many items will have release or street dates listed on them. For backorders, expected restock date will not be listed. Your sales rep will contact you when your items become available. Under Processing Options on the Submit Order page, select ‘Place order on hold and contact me’. Your sales rep will call you to add your in stock preorders and backorders. If you will not be available by phone, feel free to send an email to your rep.
To submit an RMA request, complete the online form, which can be accessed by clicking the ‘Request an RMA’ link under Services and Support at the bottom of the page. To view our RMA Policy, click the ‘RMA Policy’ link, which is also located under the Services and Support. This portion of the dashboard is currently still under construction, and that information is not available on the website at this time. We hope to have it available in the near future.